How about some locally-raised beef, pork or lamb for dinner tonight? 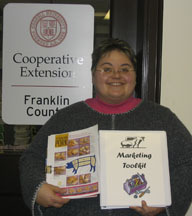 With funding from the Northern New York Agricultural Development Program (NNYADP) and the New York Farm Viability Institute, Inc., Bernadette Logozar of Cornell Cooperative Extension of Franklin County has assembled a marketing toolkit to help livestock farmers sell their products and capitalize on the increasing numbers of people looking to connect to local farms and local food sources. The kit debuted at November 2006 meetings with speakers from the NY Beef Industry Council and the New York State Department of Agriculture and Markets in Lowville and Saranac Lake. Logozar (at left) a rural and economic development specialist, says potential income streams for livestock producers include direct-to-consumer marketing, freezer trade, live sale, central pooling for auction sales, contracting with meatpackers. The NNYADP project’s current emphasis is on beef, pork, and lamb. The new livestock marketing toolkit includes best management practices profiles, promotion materials, and a 17-page checklist that covers production costs, processing, pricing, food safety, advertising, PR, industry associations and where to find resources. Logozar says producers often begin by selling to neighbors and friends. Among the tools she has gathered to help the farmers communicate with consumers are quick and easy recipes; nutrition facts; tips for how to cook grass-fed meats for best quality and flavor; Mediterranean and other regional-style recipes; and recommendations for pairing meats with wine, cheeses, and desserts. For customers who want to deal directly with the meat processors, farmers can provide charts that illustrate and estimate the types and quantity of roasts, rounds and rib eyes one can expect from, for example, a 1,500-lb steer. Although the current focus is on beef, pork, and lamb production, Logozar allows that interest may drive the project to include goats, poultry and other livestock; value-added on-farm processing; and fiber and hide processing.